School improvement begins with self-examination and honest dialogue about socialization, bias, discrimination, and cultural insensitivity. The authors acknowledge both the structural and sociological issues that contribute to low-performing schools and offer multiple tools and strategies to assess and improve classroom management, increase literacy, establish academic vocabulary, and contribute to a healthier school culture. Reflect on current practices, and identify areas for improvement. Spot the factors that can be harmful to school cultures. Identify your school as high will/low skill, high skill/low will, low will/low skill, or high will/high skill. Develop a blueprint for achieving skilled pedagogy and successful school improvement. Gain practical classroom management strategies and activities. The question of how to improve schools has long plagued practitioners, researchers, policymakers, and community members. Some have argued that the problem with low-performing schools is cultural—related to the people within the system and their beliefs, norms, attitudes, and behaviors (Green, 2005). Others have argued that the problem is structural—related to the structure of our educational system and its policies, practices, and procedures. They believe that low achievement is the product of a bad system (Viadero, 2010). We assert that it is a combination of the two—not one or the other—that has led to poor outcomes for students, particularly for struggling and underserved students, many of whom are from minority groups. With the passage of No Child Left Behind in 2001, closing achievement gaps among diverse student groups became a focus of the federal government in the United States, as schools and districts were required to disaggregate student test scores and other performance data by student characteristics. This legislation created both a greater awareness of racial disparities and a rising concern about other kinds of achievement gaps, such as socioeconomic. In the decade since the law passed, most achievement gaps have not been closed to an appreciable degree, despite the introduction of more targeted interventions for different groups of students. The National Assessment of Educational Progress (NAEP), an annual test distributed to a diverse cross-section of students in the United States, shows that, over time, Black and Hispanic students have made small strides in improving their performance in reading and mathematics, although their still exists a gap between their achievement and that of their White peers. For example, Black and Hispanic students trailed their White peers by an average of more than twenty test-score points on the NAEP math and reading assessments at fourth and eighth grade, a difference of about two grade levels (Annie E. Casey Foundation, 2011). The problem of disparity among racially and economically diverse students does not stop with standardized testing. A National Center for Education Statistics report cited that while 82.7 percent of Asian students and 78.4 percent of White students in the class of 2008 graduated on time, only 57.6 percent of Hispanic students, 57 percent of Black students, and 53.9 percent of American Indian students graduated on time (Annie E. Casey Foundation, 2011). In addition, low-income and minority students tend to have less access to the most effective, experienced teachers with knowledge in their content field. One study of forty-six industrialized countries found the United States ranked forty-second in providing equitable distribution of teachers to different groups of students. For example, while 68 percent of upper-income eighth graders in the United States in this sample had math teachers deemed to be of high quality, that was true for only 33 percent of low-income eighth graders (Braeden, 2008). We assert that, despite these statistics, student ethnicity and social class are not barriers to learning; rather, schools that do not properly respond to the needs of these students are the barriers. Schools must adopt a new, more comprehensive approach to ensure learning for all students, especially underserved minority students and those from poor communities: a healthy learning environment coupled with responsive learning activities developed around the specific needs of diverse students. This, we believe, is the right formula for universal school success. The student is the center of the school universe, and the learning environment and learning activities must be responsive to student needs if we are to avoid achievement gaps. It is our belief that successful school improvement requires that educators have a combination of both will and skill to ensure a quality education for every child in every classroom. Will is the belief that all children can learn and perform academically. Educators must be leaders of this will within their school culture. Skill is the use of responsive instruction that is the practical key to ensuring that students learn at high levels. For underserved students especially, it means engaging and reaching students on their own terms with attention to their cultural, home, and community experiences. Educators can have the will to lead, but if they lack the skill to teach, then student learning will fall short of our desired outcomes. Above all, our teaching must be tailored to student needs, not to the needs of educators. The reform process that we advocate involves a combination of will development (developing the learning environment) and skill development (developing instruction). 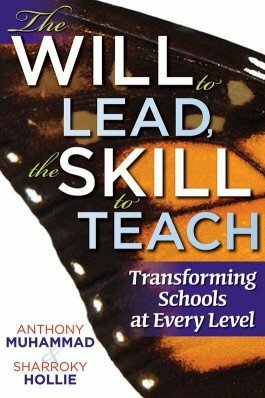 In chapters 2 through 5 of this book, Anthony explores the following elements of developing will. Schools are microcosms of our larger society. Educators' socialization plays a major role in their view of how the school should operate and whether or not they believe all students or a particular group of students will succeed academically. Successful schools recognize that educators come to school with different philosophical positions, and they seek to create a united professional paradigm for their organization in which there is alignment among staff members' beliefs, particularly about student success. Frustration can undermine educators' best intentions. When a committed group of professionals creates lofty organizational goals, there will be obstacles that make accomplishing those goals challenging. Schools that recognize these obstacles and create norms and policies that effectively confront and minimize them increase their chances of developing a powerful and positive learning environment. Philosophical alignment is meaningless unless it is accompanied by behaviors that reflect commonly held beliefs. This means creating an environment in which educators are compelled to align their behaviors with the needs of the student body. This step is very important in the development of a positive learning environment, and it must be done in collaboration. Once a staff cultivates a culture with behaviors that meet the needs of students, it must create policies, practices, and procedures that reflect those beliefs and behaviors. This involves leadership at both the formal and informal levels, including teachers, site administrators, central administrators, and local and national policymakers. In chapters 6 through 11 of this book, Sharroky examines skill development through the implementation of responsive pedagogy. His insight comes from his work as a cofounder of a charter school in Los Angeles—the Culture and Language Academy of Success (CLAS)-which has become a national model for culturally responsive teaching and is known for its success with underserved students, particularly African American students. Much of the content of this section of the book is based on the instructional practices implemented at CLAS. According to the California Standards Test and the Academic Performance Index (API), CLAS has maintained high achievement data, specifically in English/language arts, compared to the local district and the state. According to the API, CLAS scored an 822 for its elementary school and a 728 for its middle school in 2010. Additionally, nearly 60 percent of the students are advanced or proficient in reading/English/language arts according to the federal report card (adequate yearly progress, or AYP). This section examines the following elements. What Is a Responsive Pedagogy, and Why Is It Important? Teachers often have many tools in their tool belts when it comes to working with students. However, they do not always use these tools responsively. Responsive pedagogy validates and affirms students and their cultural and linguistic background, creating a bridge to academic success. This responsive pedagogy differs from traditional one-size-fits-all strategies by seeking to engage students on a deeper level, thus drawing them into the learning process. It avoids deficit thinking and is suitable for not just struggling students, but all students. Three steps form the basis of developing a responsive pedagogy: (1) identify an area of instruction for improvement, (2) assess the quantity and quality of the activities currently used, and (3) implement responsive activities during teaching. These steps help teachers find their path from traditional-only instruction to responsive instruction. There are four areas in which responsive instruction is most critical: (1) classroom management, (2) academic vocabulary, (3) academic literacy, and (4) learning environment. This book takes an in-depth look at responsive activities within these four areas that have been implemented with success at CLAS and in the authors' work with teachers and students, along with key philosophies, premises, and strategies on which responsive instruction in these areas is based. We believe that will and skill must go hand in hand if schools are to improve. Educators must have the will to lead and the skill to teach. We challenge the traditional assumption that culture and structure are separate issues. We contend that educators must be engaged in creating a school environment with high will and high skill if students are to be successful. In addition, this cannot be done in isolation. All educators must be involved in the development of culture and pedagogy. In their work on professional learning communities (PLCs), Richard DuFour, Rebecca DuFour, and Robert Eaker (2008) note that educators must (1) determine what they want students to learn, (2) decide how they will know if students have learned, and (3) determine how to respond when students haven't learned. The students who have not learned—the students who struggle and are most often underserved in our schools—are the targets of this book. To be sure, all schools face the issue of students who are not achieving—regardless of demographic profile. All students who struggle need a proper organizational response. However, in this book, we focus on the students who have been traditionally under-served by the current system. Do some of my personal assumptions, beliefs, behaviors, and habits contribute to the underperformance of some of my students? Do my instructional practices or instructional leadership practices contribute to the underperformance of some of my students? We do not advocate the ineffective strategy of blaming the client—students, parents, and society—rather, we encourage the grueling work of looking into a personal and professional mirror and asking what we can do to positively affect the lives of struggling young people. Many great theories have emerged before this work, and we respect and recognize the contributions of others, but we also recognize that the standard approach to helping struggling students has failed, and we seek to reframe the conversation around new approaches to culture and pedagogy. School improvement begins with self-examination and honest dialogue around topics that are not often talked about, like institutional culture, personal beliefs and motivations, bias, discrimination, and cultural insensitivity. In this book, we do not duck those topics—we deal with them head on. All children have the right to have their gifts and talents cultivated through the process of education. All children can learn and become educated. However, statistics reveal that all students are not realizing the promise of an educational system set up to meet their diverse needs. In a report released by the Thomas B. Fordham Institute and Basis Policy Research, of 2,025 chronically low-performing elementary and middle schools identified in ten states in 2003-2004, only about 1 percent had improved enough to exceed their state's average academic performance five years later, and fewer than 10 percent had even broken out of the lowest 25 percent of schools in their state (Sparks, 2010). If we were to measure the current performance of the public school system against its stated objective, most would agree that the system has not met its goal. Additionally, we can agree that most struggling students within the system come from very predictable social groups identified by race, socioeconomic status, disability, and gender (Shaw, 2008). This lower-than-desired performance by schools and students has spurred an international debate about what it takes to turn a failing school around. We believe failing schools can be turned around, and we believe developing the will to lead and the skill to teach—a focus on culture and structure—within every school is the key to this transformation. We infuse the concept of cultural responsiveness throughout this text because we believe that understanding the whole student is critical to properly serving the student. Teachers can use this understanding as a bridge when helping students achieve mastery of the academic curriculum. Effective schools meet the needs of the student. We argue that to truly close achievement gaps, schools must do this for all students, not just for some.